4 Days until the Barrie Colts 2018-19 Home Opener! (Joey Keane) #OHL - Very Barrie Colts | A website covering the Barrie Colts of the OHL. 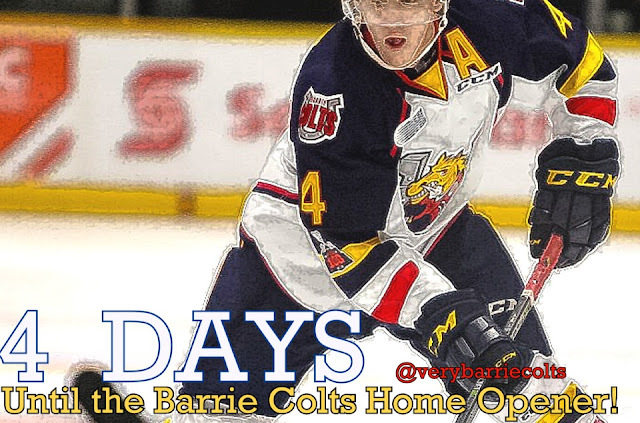 There are 4 days until the Barrie Colts 2018-19 home opener! Joey Keane currently wears 4 with the Barrie Colts. Keane was selected 87th overall by the Ponies at the 2015 OHL Priority Selection Draft. He went to play with the Dubuque Fighting Saints of the USHL before coming to Barrie. There, he would score 2 goals and add 9 assists through 55 regular season games. The Saints would go on to the Clark Cup Championship to get swept in 3 games by the Tri-City Storm. Joey put up a goal and an assist through 12 playoff games. From there, Keane made the move to Barrie to make his OHL debut for the 2016-17 season. As a rookie, he posted 1 goal and 18 assists. His sophomore season showed a huge jump in production with 12 goals and 33 assists. His +45 was a team best and 3rd league wide and he was also named to the OHL Third All-Star Team. Keane has played in 129 OHL games and has 13 goals and 50 assists. At the 2018 NHL Draft, the New York Rangers drafted Keane 88th overall. He had a strong showing at camp but is back in Barrie to compete in his 3rd season with the Colts. Keane is one of the more offensively dominant defencemen in the OHL, and look for him to make a big jump production wise. No doubt, he will land top pairing minutes and be a huge part of the Colts back end for the 2018-19 season.